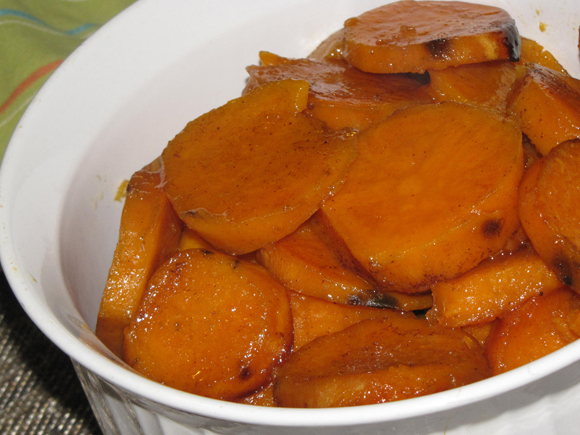 You know those sweet potatoes you have every Thanksgiving? Yeah, those. They're swimming in buttery sugar and are good, but they can sometimes be too sweet and make your teeth hurt. Or maybe that's just me... Anyways, those smothered potatoes are okay, but I'm over it. Maybe my tastes are changing as I grow older, but the idea of eating a vegetable dish that tastes like something I can buy at a candy store just isn't my thing anymore. The pork roast I made the other night was that regular meal that needed a side dish with pizzazz Since I had a couple sweet potatoes laying around, I thought they would be the perfect accompaniment. And I also thought that I'd reinvent the traditional way of cooking them while I was at it. I've been wanting to cook up some sweet potatoes in the crock pot and since Thanksgiving is right around the corner, I decided I'd go with the same theory as the original but tone it down a bit. I cut up the sweet potatoes, made a little butter and sugar mixture, put everything in the crock pot and walked a way for a couple hours. I seriously cannot stress enough how easy this was. And the end result tasted almost like the baked version, but it let the natural sweet potato flavor shine through. They had a hint of sugar, a little bit of tang, and were tender but not mushy. There wasn't much liquid in the pot which means the potatoes got a nice coating of flavor without soaking up too much mush-producing butter. And the best part of this dish is that you can free up valuable oven space without having to worry about fitting in another side dish! Voila. Non-smothered or mushy potatoes, incredibly easy prep, and a little bit less stress if you make them on the big day. 1. Slice potatoes into 1/2" rounds and set aside. 2. In a medium-sized, microwave safe bowl, melt butter in microwave. Stir in lemon juice, salt, cinnamon and sugar. 3. Toss potatoes with butter mixture. 4. 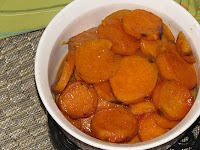 Spray crock pot with non-stick spray and pour in sweet potatoes and butter mixture. 5. Cook on high for 2-3 hours.